From hair growth to dandruff, neem oil is the nature’s cure for your scalp and hair problems. Neem oil is extracted from the seeds and fruits of the neem tree, a large-sized evergreen tree, which is known in the Indian sub-continent since antiquities. The name neem comes from the Sanskrit* word ‘nimba’, which means sprinkler of nectar. 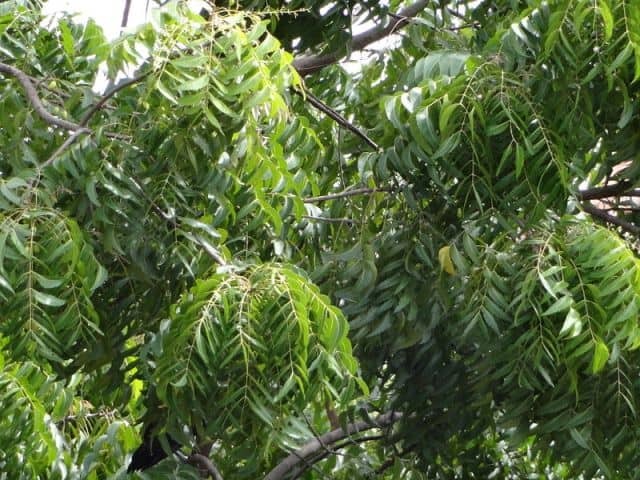 An important part of traditional Indian medicine, neem has been used to treat various skin and scalp conditions, reduce swelling and inflammation, get rid of parasites, and help with many other illness. Neem contains more than 35 biologically active ingredients and has many medicinal properties. Here’s how neem can help you get a healthy scalp and hair. With extraordinarily high levels of antioxidants – a lot more than those found in blueberries or spinach – neem oil protects the scalp skin from ongoing damage that is caused by the free radicals. Neem also has regenerative properties that support healthy cell division and stimulate hair follicle growth and function. Regular application of the neem oil will promote thicker, stronger, and more luxurious hair growth. Neem oil contains several fatty acids – such as linoleic, oleic, stearic acids – that nourish and condition the scalp and hair. It’s moisturizing effects revitalizes and restores dry, under-nourished or rough hair to a smooth, silky texture. For deep conditioning, massage through the scalp and hair with fingertips. Cover hair with hot towel (not too hot that it hurts, but tolerable) and allow to penetrate the hair for 20 minutes or so. Wash as usual. Your hair will become shiny, healthy and more manageable. Neem oil is effective against several human fungi including candida, which is one of the major cause of dandruff. Also when you have dandruff there is some underlying inflammation going on that makes the scalp red and irritated. Inevitably, neem oil will take care of everything as along with anti-fungal properties, it also has anti-inflammatory and antiseptic effects that help with redness and scalp irritation. Use this potent oil to get rid of dandruff or even as preventive measure, in case you are prone to getting it. Eczema or dermatitis is an inflammatory skin condition characterized by itchy, dry, red, flaking and crusting skin. Nimbidin, an anti-inflammatory substances in the neem acts similar to non-steroidal drug (phenylbutazone) and helps reduce the redness and irritation. In addition, neem oil is rich in fatty acids and glycerides that easily penetrates the outer layers of the skin, and restores the protective barrier, thus preventing the moisture loss. Neem is also a strong analgesic (pain-killer). So, it will bring relief from the excruciating discomfort caused by dry itchy eczema skin. And its strong antiseptic and antibacterial will help to keep bacteria and secondary skin infections at bay. Also touted as scalp savior, its immense healing properties – anti-inflammatory, antiseptic, antibacterial, anti-fungal, anti-viral – help to keep the scalp skin in good health. Plus, neem oil is also considered as cooling, soothing and astringent in nature. Using neem oil on a regular basis on your scalp will regulate the secretion of sebum (scalp’s natural oil) and also work to normalize oily or dry scalp conditions. Due to its high medicinal value and emollient qualities, neem oil is often used in skin and scalp care products. Neem oil is one of the best home remedy to treat head lice and nits. Neem contains azadirachtin, an insecticidal ingredient, which disrupts the growth and reproduction of lice, and so it will eventually kill them. Plus, the other ingredients in neem inhibit the swallowing system of lice, thus reducing their appetite to the point of starvation. In addition, the pungent odor of neem oil is strongly disliked by lice, thus keep them away from crawling into your head. Thus, you can also use this oil as a preventive treatment. Neem has a pungent, somewhat bitter and antiseptic-y odor. There have been efforts to mask the smell of neem oil by using various chemical (harsh & not so good); and do you think that will keep the qualities of neem oil intact? Perhaps, its time that we grow our senses and understand the difference between good pungent and synthetic sweet. Although it is possible to lighten the odor to some extent by combining the neem oil with aromatic essential oils like lavender, tea tree, or orange. When using neem oil, dilute it with base oils like olive, avocado, sesame oil, or jojoba oil. You can use between 10 to 20% neem oil in a blend. You can also add 4 to 5 of drops of lavender or ylang ylang essential oil to mask the smell, as well as enhance its effects. Here’s a blend that you can use: Take 1 tsp of neem oil, 3 tbs of avocado oil, and 4 to 5 drop of lavender oil. Mix all the ingredients well. Apply this on your scalp and hair and massage gently. Leave it for about an hour or so and wash as usual. You can also leave it overnight for more effectiveness. Koriem, K. M., (2013), Review on pharmacological and toxicologyical effects of oleum azadirachti oil. Asian Pacific Journal of Tropical Biomedicine,3(10), 834–840. Kumar, S. P., Mishra, D., Ghosh.G., Panda. C. S., (2010) Annals of Biological Research, 1 (3), 24-34. Previous Post 7 Ways to Prevent Split Ends Next Post Is Combing your hair 100 strokes a day Good or Bad? I am looking for soap recipes for my skin, made using goat soap base and not lie. Does the neem oil whiten the black hair? Which is best neem hair oil for hair growth and for strong hair? I use neem oil now and the texture of my hair is smoother. Also, when working in the garden I do not have any issues with gnats trying to get near my scalp. I do not find the smell disturbing, so I add a few drops to natural oils made for the hair. It works to help my scalp and skin. Advice if it can make your hair grow long? There are too many factors that promote hair growth, including diet and exercise. And oil massage is one of them. Hi there.. I am sure Neem oil can promote growth. Is there something to stop hair loss/thinning? Maam, i do have grey hair at the age of 30, can application of neem oil blacken them or what would be final result? kindly help.i am depressed a lot. Neem oil will not blacken your hair, although it will nourish them. This has been very helpful, thank you. I have had severe heat damage done to my hair at a salon and have been trying to find ways to help my hair out. Could you tell me the best place to get neem oil? I thought a nutrition store but is there a specific, trusted brand that you would recommend? I also wondered if you have damage how often should you do this treatment? Do you shampoo the treatment out and then a conditioner? And I am also pregnant so just wondering if this oil is safe while expecting? Hi Jess, it’s safe to use neem oil during pregnancy. There is little reason to adulterate neem oil as it’s not very expensive. You can buy any brand. You can use it once a week. Is it necessary to wash hair after applying neem oil? No, it’s up to you. Hi Minaz! Love your site. What are thoughts on using a neem oil and rice water regimen for hair? Also, do you know whether it safe to use neem oil or rice water on relaxed hair. I am growing out my relaxed hair (I’ve been relaxing for years). My hair looks pretty good but I want to get it back in tip-top shape. Thanks! Hi Andrea, I don’t see why not. Because you have not used these two things before, use them separately to see what is working better for your hair. I have lots of scalp pimples can I still use been oil ? Here are some home remedies for scalp acne. Interesting post! I had a whole bottle of neem oil leftover from a skin ailment I was treating it with, never thought to use it on my hair. I actually did this last night and although it was great it left a very greasy feeling in my hair. Using a natural shampoo was enough to wash it out though. Thanks for the tip! Can you mix amla oil and neem oil together? What is in your amla oil?? I mix a few drops of neem oil with my shampoo when I wash my hair (every other day) and occasionally also mix it with some almond oil and apply it directly to my scalp to moisturise and as a hot oil treatment. I’ve found it has helped to control my psoriasis and dry, flaky scalp as well as boosting hair growth and making my hair soft, silky and shiny! I have been suffering with folliculitis of the scalp for over 15 years, any suggestions that will cure this? I’m desperate. Have you see a doctor? Try massaging with coconut oil. Also aloe vera juice may help. Well i am using neem oil for years and i have so much thick hair. I will certainly recommend to everyone to try because its a wonder oil. People usually tell me that you have healthy hair, and at that moment i feel i can rule the world 🙂 Go on guys give it a try! Should neem oli be diluted ? Or can we you use it directly. I have some problems with my neem soap (I purchased a hand made one with 20% neem oil). On skin is very nice, but after washing my hair, they seem sticky, heavy, almost greasy, mat. Is it neem oil (I used to wash my hair with black African soap before without such issue) or part of sebum regulation process (has to get worse before gets better)? 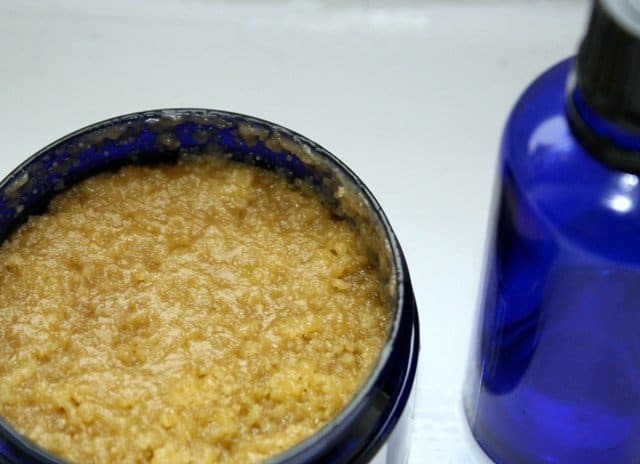 From what i know, if your hair feels greasy after washing with a handmade soap (handmade soap has a lot of glycerin), so you have to use apple cider vinegar conditioner to wash it of. Just mix a spoon if acv with 3 spoons water andput on your hair. Wash with water afterwards. Hi Rose, did you apply neat or mixed it with other oil? After a severe hair loss due to stress my hair are finally growing back! So many baby hairs after so little period of time. Also my hair feels healthier than ever before..they are really shiny and soft! How did you use it? I would like to try this for my own hair. Please email me [email protected] and let me know. I do not want to go the chemical route. ive been using a hair oil i concocted. I start with about 4 tbsp of coconut oil. add about 20 drops each of lavender, rosemary, basil, atlaswood(cederwood), neem,and about 5-10 drops each of pine and assorted mints for scent, ylang ylang and helichrysum. i really think ive noticed a difference around my (receding) hairline with thicker hair, less breakage, much softer hair and it feels stronger. id recommend this to anyone. That’s awesome Jayme! Thanks for sharing your results. Did you also make any dietary changes or any other lifestyles changes? Hey there Jayme! I’ve been doing a lot of research on essential oils lately (I have a natural skin care line). To use essential oils safely, you should only be using 6-12 drops of essential oil per 1 ounce of carrier oil. With this hair recipe you are using, it seems you are using too much essential oil and I don’t want to see you get hurt! Google “how to use essential oils safely” or some similar search. Good luck! Have you noticed any difference? I’m thinking on using this for my husband. Nice article. I knew neem has medicinal values. Had no idea it can help with hair. Thanks Ria, Glad you liked it. Thanks for the deep conditioner, it was really good. I have never tried neem oil before. Do you think over the counter neem oil is effective? Leenaji, Thanks for your feedback on conditioner. When you buy neem oil or any oil just make sure they are cold pressed and not refined ones, as cold pressed oils retain the maximum goodness.